"We are using neutrons to study thermoelectric materials, because we can tune their energies to match the lower energy of the phonons, which provides a higher resolution," said Tyson Lanigan-Atkins, a Ph.D. student at Duke, in a group working under Olivier Delaire, associate professor of mechanical engineering and materials science. "Neutrons also enable us to conduct research in more complex sample environments, like the custom encapsulation we are using in a high-temperature environment." "The material becomes very unstable—essentially it begins to evaporate—under vacuum conditions and in common gas environments, which is typically how we perform high-temperature experiments," said Jennifer Niedziela, a vibrational spectroscopist in ORNL's Nuclear Science and Engineering directorate and former postdoctoral researcher in Delaire's group. "Anticipating these issues, we encased the samples inside quartz capsules to maintain a controlled atmosphere around the sample, which enabled us to study the phonon dynamics. 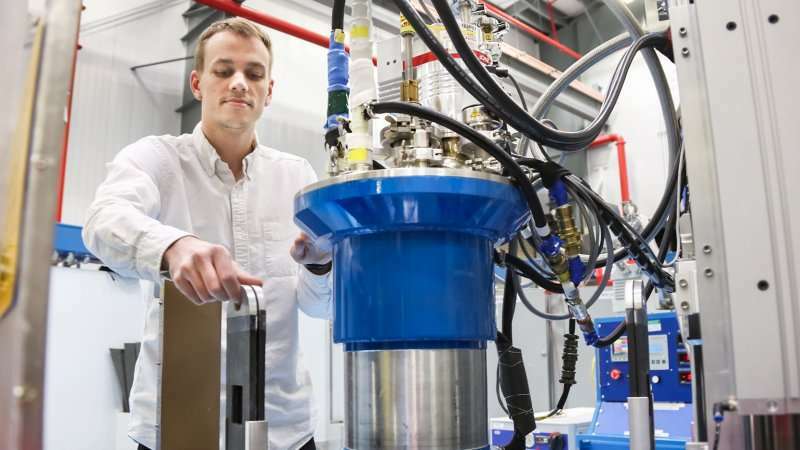 This highlights another advantage of neutron scattering in that we can put a lot of material in the path of the neutron beam, like quartz, wool, and wires, and still see the signals that interest us." Previous efforts to resolve acoustic phonon linewidths below 1.0 milli-electron volt (meV) were not successful due to the resolution limits of the neutron instruments employed. However, the cold neutrons delivered by the CTAX beamline are well-suited for high-resolution measurement of lattice dynamics in crystalline solids that have a high signal-to-noise ratio, such as thermoelectric materials. "Using the triple-axis spectrometer at CTAX, we obtained excellent data on the linewidth of acoustic phonons below 1.0 meV in a high-temperature regime," said Niedziela.